Receiving your Sew Confident! tutorials is easier than ever! You will receive your files automatically. Here’s a few tips and tricks to make the downloading process a little easier! Important! You must login to your account or create an account on our website to access your tutorials online! Once your order is placed, you will automatically see your tutorial files. 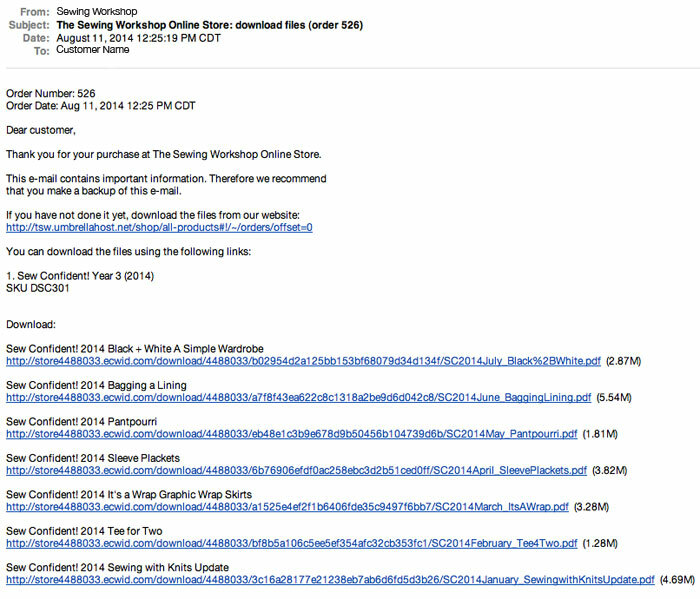 Files are listed on the Order Confirmation page. See Current Year Access for more information on downloading your tutorials after initial purchase. You will also receive an email immediately after your order is placed. Click on each link, save file and ENJOY! See Storage or Printing section for further details. 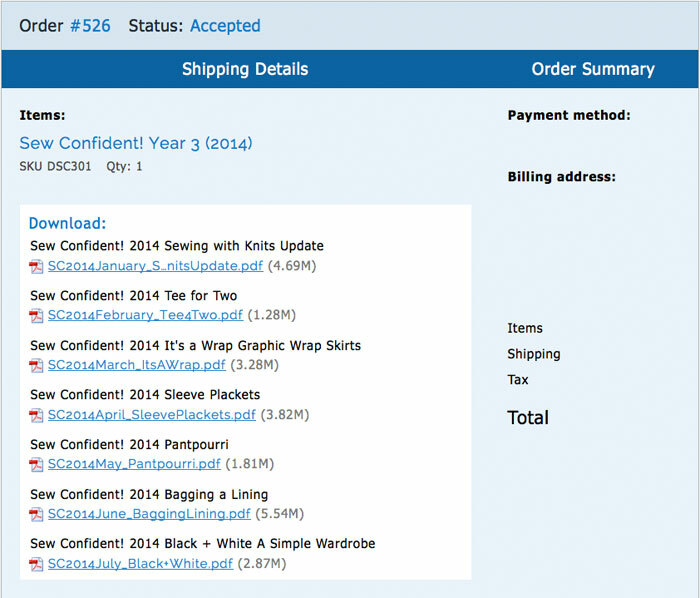 When subscribing to the current year of Sew Confident! you can access your files right away via your online account only. When a new tutorial comes out each quarter, you can access previous and new tutorials online. 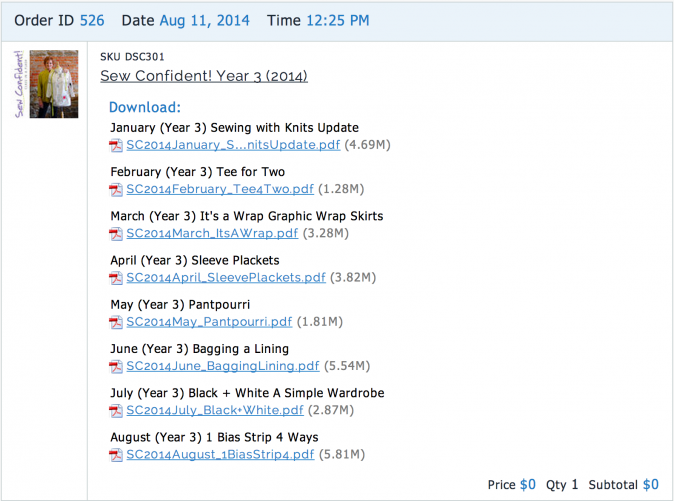 Follow the steps below to access your sewing library. Click LOGIN along top bar or use direct link here to access your account. Click on YOUR ACCOUNT to the right of Hello, Customer Name. All orders will be listed below. Hopefully you will have many orders listed! Find your Sew Confident! order according to year. Your files will be available for download anytime. You can access your Sew Confident! tutorials anytime! Use the Downloading instructions above. Once downloaded you can store the files on your hard drive or portable device. Example: To store file(s) on your iPad, email the file(s) to yourself and open in iBooks. 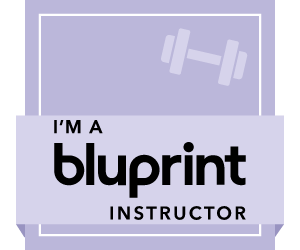 Print each tutorial on 81⁄2" x 11" paper and organize each tutorial in a binder. You will have quite a sewing library once the year is done! Click here to view our handy measurement charts. Click here for help with Pattern and Tutorial Downloads. 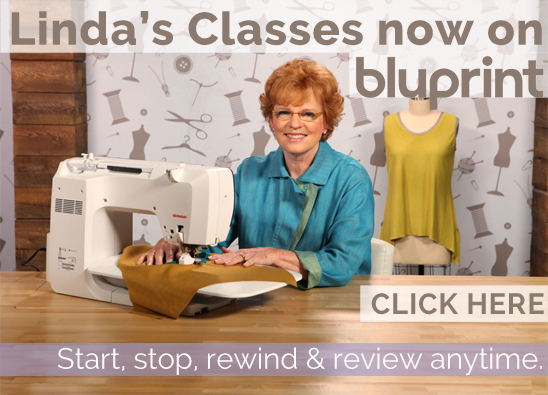 Don't miss the lastest promotions from The Sewing Workshop! CLICK HERE to sign up for our email list. Click here for help with Sew Confident! files. © The Sewing Workship LLC. All rights reserved.